In many traditional computer science classes, students acquire a specific set of technical skills such as programming or algorithm design. In Ehsan Hoque’s Human-Computer Interaction class, along with acquiring new technical skills, students spend time thinking creatively about computers and ways they can use computing to solve pressing problems in society. Toward that goal, students in the class spend two months developing a technical product that could potentially be deployed in the wider world. 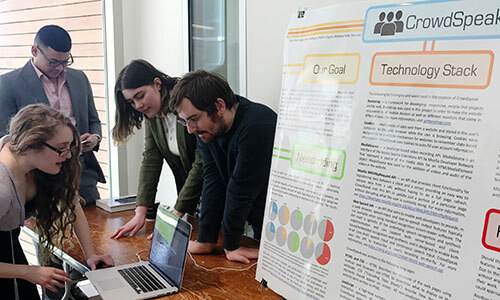 The students in the class presented their design projects in a showcase at Wegmans Hall in May, with live demonstrations of programs that included a mixed reality interface to help stroke patients, an app that gives live notifications on current events at the University, and programs to help non-native English speakers with pronunciation and grammar. Every year 795,000 people in the United States alone suffer from strokes. Of the 655,000 people who manage to survive, 80 percent are left with a weakness or inability to move one side of the body. Students developed a mixed reality interface program that generates a virtual appendage to allow patients to become better reacquainted with muscular control and help them regain full control of their motor function. Athena is an app to help international students in the United States say what they intend to say with the correct English pronunciation. 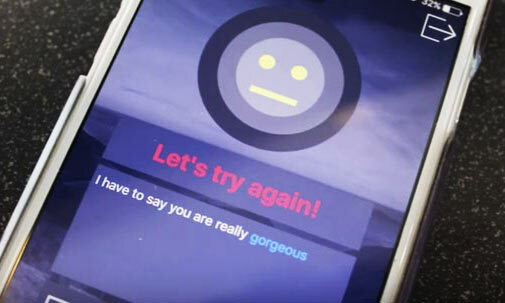 Users record a phrase and the app gives feedback on pronunciation. The current target users are US international students, but project team members envision the technology could help immigrant users get jobs, improve health services, and communicate more effectively. Meetings can be complex when participants hail from various parts of the world and have different cultural norms and backgrounds. 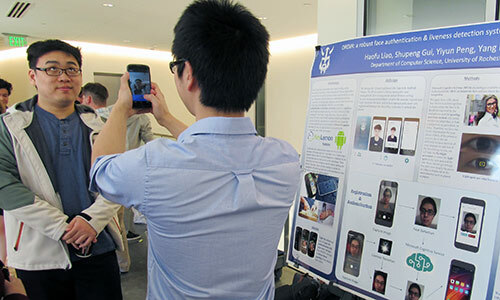 Students worked on a program that records audio and visual data from individuals conducting video conferences. The program analyzes facial expressions, prosody and language, and provides feedback to participants to improve their communication during meetings, keeping their cultural norms in consideration. When two surfaces interact with each other (for example, a finger and a table) they produce a unique sound wave that can be captured with a microphone connected to a computer. 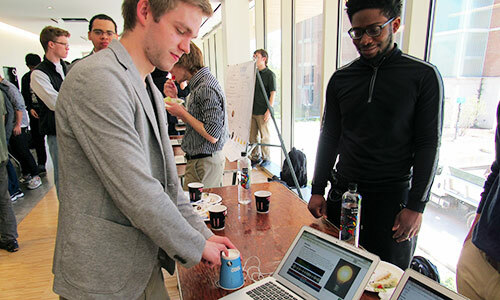 Using this idea, students created a device called Gesture Link that allows users to control smart devices in their homes, such as lights or music, through gestures rather than relying on a smartphone. This solution is low cost and transforms very large surfaces into highly accurate human-computer interfaces that are specially tuned to gesture recognition. Researchers have long puzzled over the problem of smartphone protection. Various approaches include fingerprint and iris authentication. However, threats loom from hackers who are able to spoof these methods. ORDIN is an authentication system that unlocks a phone by looking at the user’s face and knows the difference between a user’s actual face and a photo or video of the person. 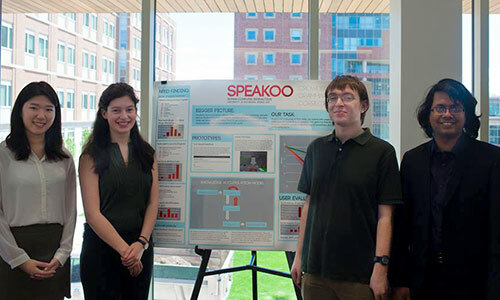 Students developed the program Speakoo to help ESL learners improve their English skills. Through Speakoo ESL learners record and submit videos of themselves speaking and get feedback from native English speakers on the accuracy of grammar, pronunciation, vocabulary, and content development. 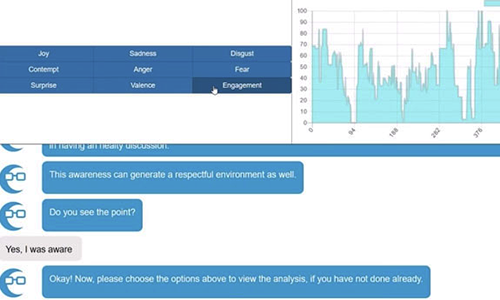 Some of the objective feedback is generated by the machine, while peers in the learning community contribute subjective feedback. 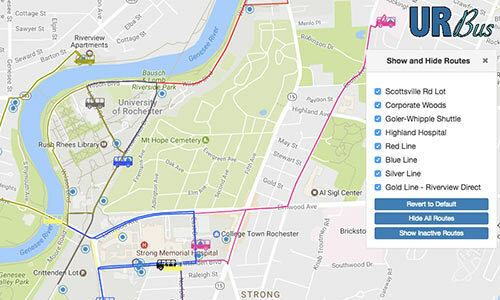 Where’sThat is an iOS app that aims to facilitate deeper connections within the Rochester student body and increase attendance at campus events. 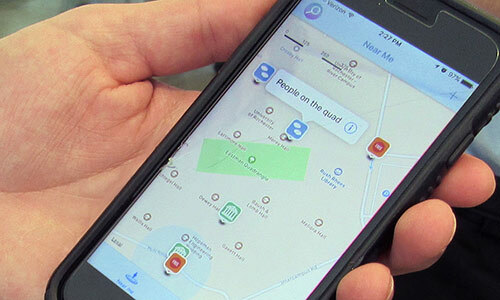 The app uses an interactive map interface to provide live updates about what’s happening on campus. Students can filter their notifications based on the kinds of events they wish to be notified about—concerts, study groups, free food, and so on. Where’sThat has been deployed in the Apple app store. CrowdSpeak is a transcription program that provides users an outlet to practice speaking English outside of a school or formal setting. The program automatically transcribes a user’s video and subsequently utilizes crowd-sourced feedback to critique the user’s tone, pronunciation, and accuracy. Vibrato is an important aspect of music performance, and objective feedback is helpful for musicians who either can’t hear themselves properly (as is the case with singers) or hear themselves in a biased way. 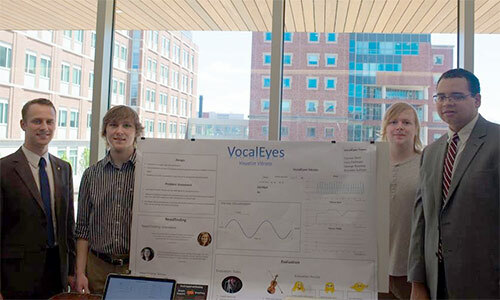 Students created a tool that enables musicians to measure and visualize their vibrato during practice sessions.